CHESTER — Love to paint in a fun group setting? Want to support critical Alzheimer’s research? 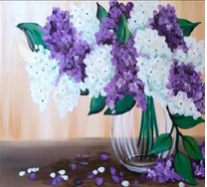 Join the Chester Village West independent seniors’ community to paint for this cause on Monday, Aug. 21, from 3:30 to 5:30 p.m. With guidance from award-winning local artist Gloria Nilsson, participants will paint a beautiful floral arrangement. Light refreshments will be served. Per-person donation for the event is $35; proceeds will support the Alzheimer’s Association of Connecticut. Seating is limited. Call (860) 526-6010 to reserve your space. Chester Village West is located at 317 W. Main St., Chester, Conn. 06412.